I have a very special guest today, JH Champine. 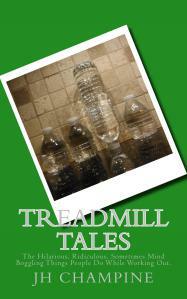 She has a new book out, Treadmill Tales: The Hilarious, Ridiculous, Sometimes Mind Boggling Things People Do While Working Out, filled with 50 entertainingly awesome stories that you will love. And, just for you, we have the pleasure of reading one of those stories. Enjoy!! People train for all sorts of things. Sporting events, marathons, 5K runs, dance recitals, hot dog eating contests, even zombie runs. If you’ve never seen or heard of a zombie run, you should take care of that. Now. Right now. While I have never participated in one, friends of mine have, and it’s supposedly one of the best things on the planet. I like my multi-day 50k walks, but a zombie run sounds like a blast.